You can drive all the traffic in the world, but if it doesn’t buy then what good is that traffic?This might sound like one of those terrible “If (something happened) but noone was around to (verb) it, did it really happen?” jokes, but I promise you it’s not. Design, usability, and conversion are hard. We work extremely hard to get traffic to our websites, but we spend comparatively little time then converting those users into customers and then keeping them coming back! We talked a bit above about using email marketing to keep customers coming back, which is absolutely part of conversion optimization. However, you can’t bring someone back that you cannot convert the first time! 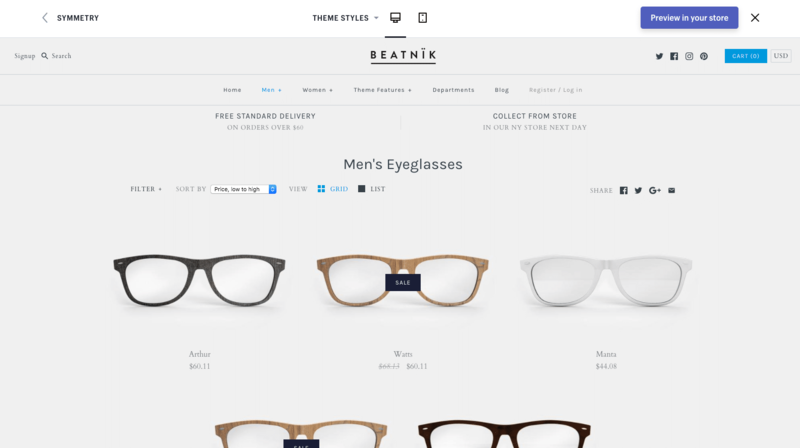 When you take a step back from your site and walk through it as a consumer, what do you notice? Actually, let’s back up a step. First you need to take time to walk through your site as a consumer. If you’re running the store then hopefully it’s something you are interested in. What do you feel? What do you have questions about? What’s not clear to you? If you feel like you can’t be objective enough, then ask others to go through your site. Ask them to describe their experience, what questions they have, if they feel like it’s trustworthy. We all get so close into our business that it’s hard to see the forest for the trees. So taking a few steps back and remembering to think like our ideal customer can be a challenge, but is incredibly important. The base of conversion optimization is about getting the basics right so that you can build off a decent base that is keeping you in business. Because after all, staying in business is the number one challenge for most companies. Product imagery. Is it high quality/high resolution or grainy? Trust. Can people see others who have bought on your site and do you have trust seals in your footer/on your site? Clarity around payments and shipping. Do you say which credit cards you support and who pays for shipping? Ease of adding to cart. Are you hiding your Add to Cart buttons low on the page? These four are table stakes. You need to build trust through your product imagery (high quality!) and trust seals on your site, then give them clarity around pricing and sizing and then allow them to add things to their cart easily. If you don’t do these, you are missing out on a lot of conversions. After the above four are taken care of, you can move on to slightly more advanced conversion optimization to make sure you are meeting your customer’s needs as well as your own growth goals. Use video to increase your conversion rates. High quality video can easily be shot on an iPhone! Look at your internal search analytics to see what people are searching for internally and make sure you have dedicated pages for those. Implement filters according to user research after understanding what they like to filter by (price/color/size/usage type/etc). Encourage users to come leave a review after their purchase and after they’ve had sufficient time to use the product. These are all meant to be ideas that you can take and run with to identify where friction may exist and where you can optimize towards your customer’s psychological needs, which leads them to buy more from you. It’s a win on both sides at that point. Annotate your Google Analytics so that you can trace back major changes in conversions to changes that you made on the site. If you read some of the popular conversion optimization blogs and sites, you will see a lot of them talking about statistical significance and running tests on pages with millions of visits a day and reaching confidence in their tests within a matter of days. Well that’s great for them, but how do you test when you only have 1,000 visitors a day, or 100 visitors a day? Can you still test? Absolutely. But how you test and the mindset you have to have going into it has to shift. If you run a site getting 100 visits a day, it is going to take longer to see conversion test results than on a site getting 1,000 visits per day. The more traffic you have, the easier it is to test and to have confidence that your tests are going to show movement forward for your company. If you only have 100 visitors a day, then you need to test big things. Small tests around fonts or button colors aren’t going to do anything. Am I the only one who gets tired of reading “case studies” of sites that changed their button color and saw a huge increase? If you want to see big results, you have to make big changes. Rework your category page to bring products up higher on the page instead of hiding them below content. Create a simpler navigation structure to prioritize the most popular categories on your site instead of listing them alphabetically. Reorganize your navigation to take it from a simple navigation to a complex navigation, or vice versa (beware here: SEO concerns with going from a large nav to a small navigation on an ecommerce store). 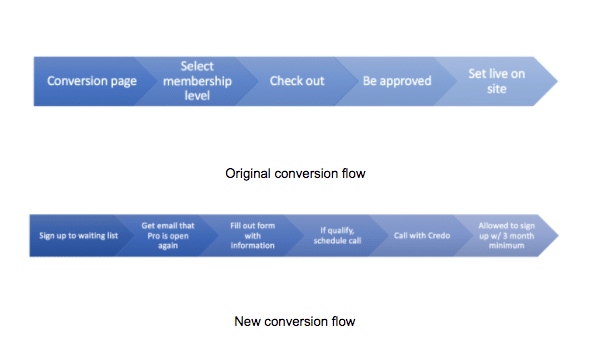 One of the tests I did was to actually add steps to a conversion flow, which ended up converting way more customers! In this early stage, nothing is make or break. Sure, don’t completely kill your conversions but at this stage the velocity of testing matters a lot more than the specific test. Just don’t test button colors, for crying out loud. Conversion testing can be overwhelming, I know. You’ve probably read the blogs and seen people saying to use tools like Optimizely or Visual Website Optimizer to test things on your site. The challenge with these is that you are most often stuck testing small things. Remember my statement above about not testing button colors? Optimizely, VWO and their competitors excel at small tests and in helping you get into the cadence of testing, but if you’re a small site with small traffic then you’re probably going to be wasting your time testing small things. Instead, as a small site I recommend taking more of a sledgehammer approach when you identify issues on your site that are keeping you from converting more of your traffic. As a large site, testing large things like a completely new conversion funnel will still show you the biggest return but you can also do more tweaking on individual pages and see results from that. Where are people landing on your site, and then where are they going? Once someone gets to a product, what is keeping them from buying? If someone lands on your homepage, how easily are they able to get to where they want to go? You’re going to need to speak with your customers (scary! ), which can be done via a few tools, like Qualaroo for surveys or Drift/Intercom for live chat, to uncover potential problems that they are having as they try to check out. Keep an eye on what problems come up time and time again and then move towards solving those first. But remember: most of your tests will fail. That’s right. You’re going to do work that doesn’t move the needle. But the ones that do move the needle should be big enough that you see great movement forward. Conversion optimization on ecommerce stores can be one of the highest leverage marketing activities you undertake. Whether it’s the marketing team or the product team owning it, or just you as the solo owner of your own shop, you can make more money from the visitors coming to your site without having to add more visitors! And of course, the real magic happens when you also increase traffic to your site and those conversions stay high. This guide is 9,000 words. Get the full guide by email.